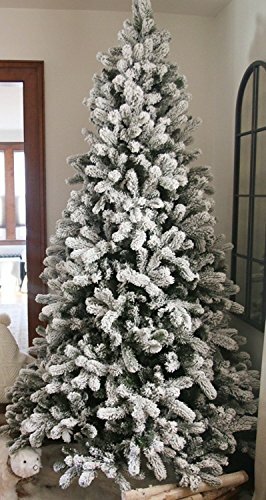 The 7.5 Foot King Flock Unlit Artificial Christmas Tree, Freshly fallen snow blankets all the trees outside and by your fireplace a King Flock Tree brings the beauty of winter indoors. Recreate the magic of a snowy winter's day with the King Flock's realistic snow-powdered, flame retardant foliage. This high-end tree boasts heavily flocked tips of PE-PVC with stainless steel cores that offer realistic presentation and require no additional shaping. A convenient hinged construction allows for easy setup of the King Flock. Wide to bottom, this high quality tree features a strong center pole of stainless steel as well as an included metal Stand. If you have any questions about this product by KING OF CHRISTMAS, contact us by completing and submitting the form below. If you are looking for a specif part number, please include it with your message.